Tuncell Mühendislik Enstrumantasyon ve Otomasyon Sistemleri Tic. Ltd. Sti. Emniyet kalıplı manometre, Tip serisi BA45 ../ BA46 .. 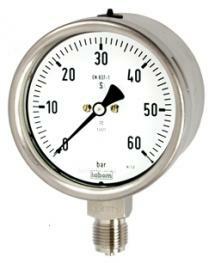 The safety pattern gauge has been designed for universal use in areas with extended requirements. This high quality stainless steel version is suitable for service in the chemical, petrochemical and foodstuff industry for measuring gaseous, liquid and aggressive media. The safety case offers increased operator protection.